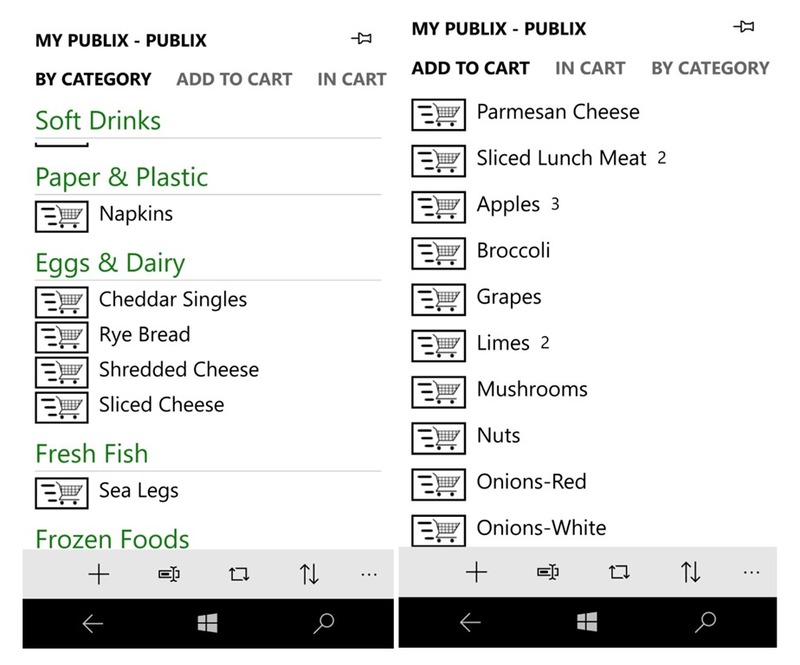 I had been using Smart Shopping on my Windows Phone as my primary shopping app since it was first launched back in 2011. It has not been updated in a very long time, but it still worked for the most part. Earlier this week I was forced to hard reset my Lumia 950, and after everything was restored from backup, Smart Shopping remained grayed out. A search of the Store confirmed what I suspected. The app was gone. It was time to find a new shopping app. A search of the Store gave me a whole bunch of choices. Most of them with 4 stars, but only a few reviews. I download three hopefuls and gave each one a spin. None of them came close to what I was used to with Smart Shopping. I took a second stab at it and came across Easy Shopping, which has a price tag of $0.99 (all the others were free), but a fully functional free trial for six days. That worked for me. At first glance it looked a little too rigid for me, with plain white on black screens and lots of text. But once I got into navigating Easy Shopping, I really came to like what I was seeing. The other apps were all glitzy, with recipes, icons, and other useful crap. I wanted a pure grocery shopping app, and that’s exactly what Easy Shopping is. Yes, it can be used for other list type tasks, but its primary use is grocery shopping. Like most shopping apps, you start out creating a store, or using the default. Then you can add/remove or modify categories, or store aisles, to suit your particular shopping needs. I don’t need Baby Goods or Pet Food right now, so I toggled those off. You can also rearrange categories to match the layout of your particular supermarket. I renamed a few categories and merged a few others to make everything more familiar to me. 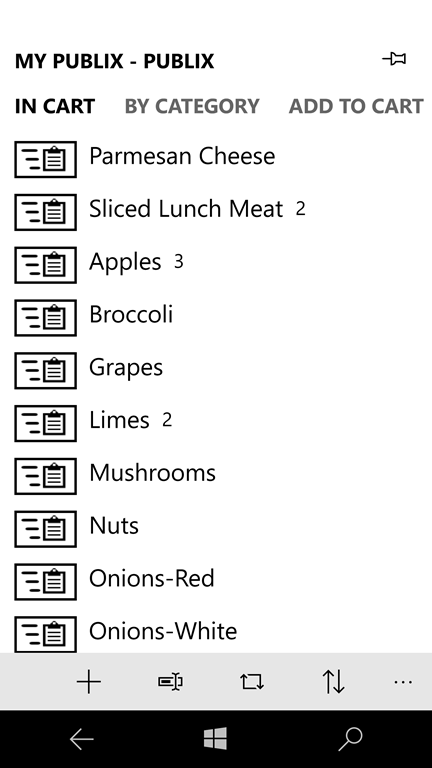 For example, I renamed the Vegetable category to Produce, and then moved everything from Fruit into Produce. Two categories merged into one, just as it is in my supermarket. Note that you have to empty a category in order to delete it. And renaming a category will update all the associated products (more of that below). I also added a few familiar categories for me; Paper & Plastic and Dry Packaged Goods. Most of the others remained the same. Smart Shopping had a favorites section, but Easy Shopping takes it a giant leap further. 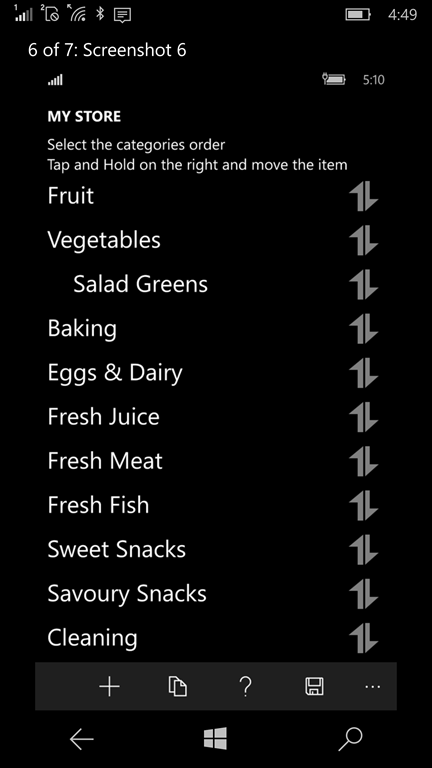 The app has a Products section, where you basically load every item you will ever buy at a grocery store. It starts out with probably 150+ items pre-loaded. But you can add as many as you like. I renamed a few, recategorized a few others, and added a bunch more. It was a bit laborious, but you only have to do it one time. After finishing I discovered, thankfully, that you can backup the database to OneDrive, which only took a few seconds and didn’t even require the typically painful connection to OneDrive. Note that this app has been written for Windows Mobile 10. In addition to OneDrive, you can also backup the database to your device. I put a backup on my SD card, just in case. 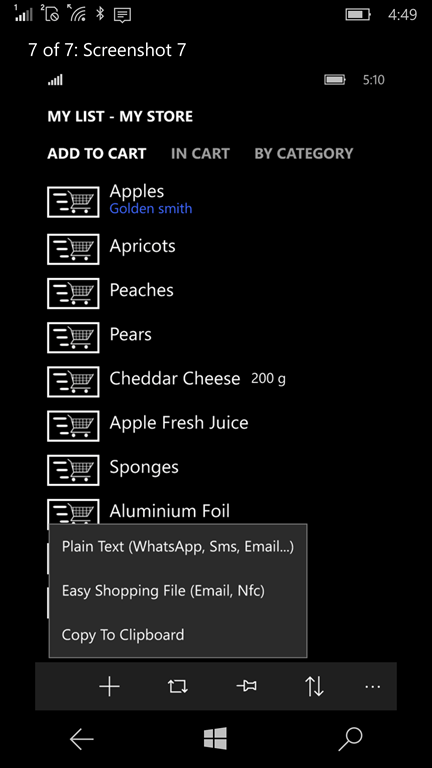 Finally, I also discovered that you can export your products list to an XLS file that will upload to OneDrive. 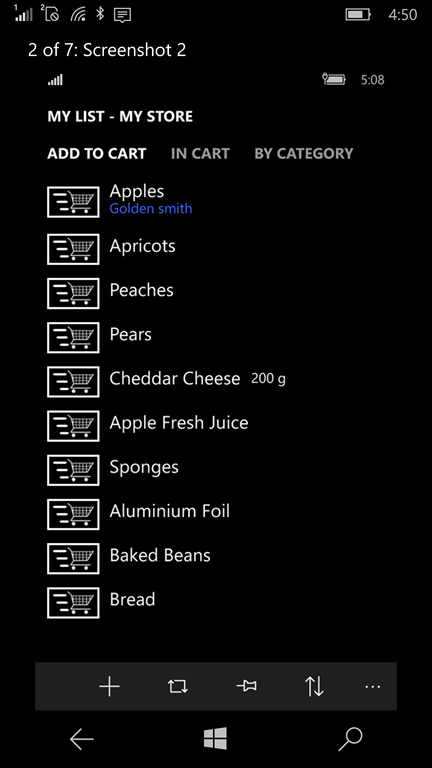 From there you can open the Excel file, modify/add to your list with the convenience of a real keyboard and then import the updated list back to Easy Shopping. I just checked and I have 232 items entered. Once you have taken care of creating your store, categories, and adding/modifying your products, it’s time to make a shopping list. 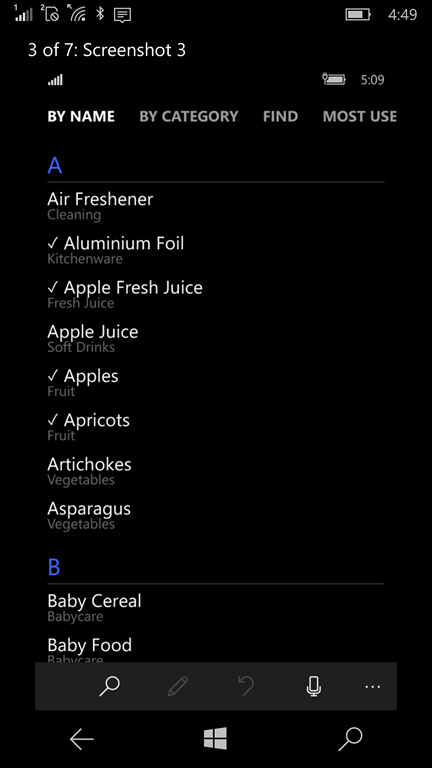 Tap the plus sign and start selecting items which are sorted alphabetically, or by category. You can tap a letter or category which displays a jump list so you can quickly navigate to other sections. Creating my list of 20-25 items this morning took a few seconds. After reading through my Publix sale circular, I added a few more on the fly. Everything today was already in my products list. 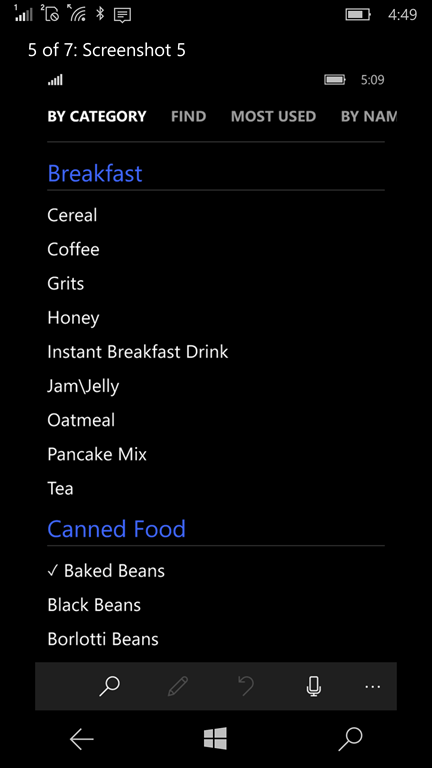 But you can also quick add items, that you can use “one time only”, or add them to the products database. 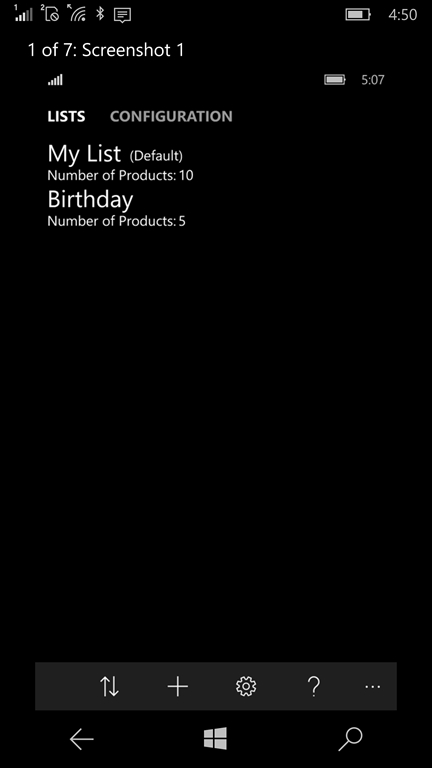 A long tap on any item opens the detail section, where you can add a quantity or a note, which will appear below a product. Like a particular brand or deal for example. Did I not say this app was intuitive and friendly. 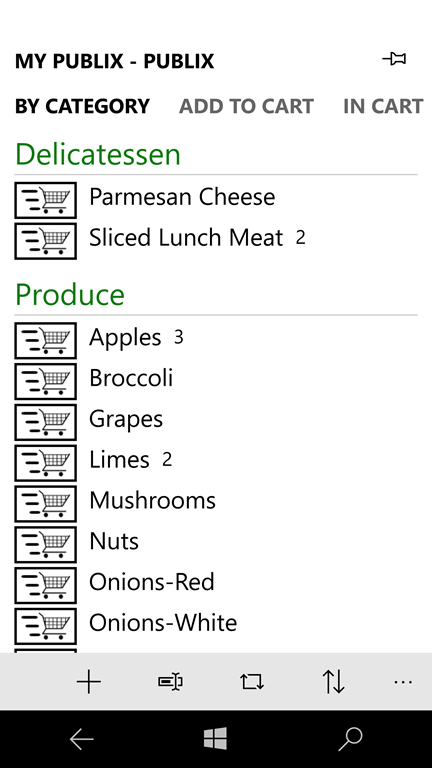 While shopping, you can swipe between Add to Cart (sorted alphabetically), In Cart and By Category. In Cart is intuitively between the other two swipes, so a left or right swipe gets you to In Cart from where ever you may be. Brilliant. 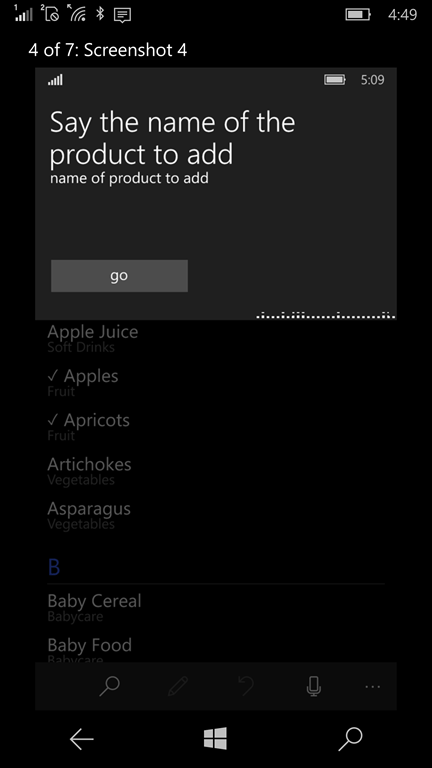 You can also set a shopping list as a default or pin your list to the Start screen. Tapping the cart icon next to each product moves it from Add To Cart/Category, to In Cart. At the end of your shopping trip two taps deletes all your In Cart items, giving you a clean slate to start over. Or, a list of some times you didn’t find on this particular trip. I like that. Overall the app works very smoothly. And with several backup options so the next hard reset will not be as painful. Although I generally prefer the dark background in apps, I changed Easy Shopping to white. I think it made the app more familiar to my previous Smart Shopping app. Either way, it still work wonderfully. No Windows 10 companion app (UWP). But with all the backup and Export/Import options, it’s not that important. Definitely worth checking out.